Home > Events > Theater & Shows > Hamilton - Boston Tour! 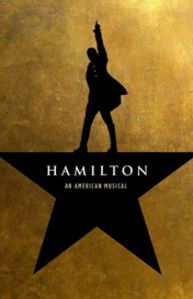 Official Website: Hamilton - Boston Tour! Featuring a score that blends hip-hop, jazz, blues, rap, R&B, and Broadway, HAMILTON is the story of America then, as told by America now. Registration for #VerifiedFan begins today (Friday, June 8) at NOON ET and closes next Friday, June 15th at 11:59pm ET. For all Hamilton Verified Fan related questions can be found here. Patrons looking to buy tickets should avoid unintentionally buying tickets from scalpers reselling tickets at many times over face value. Patrons should refer to Ticketmaster Verified Fan®, an authorized ticket seller. Registration does NOT guarantee you will be verified, receive a code or have the ability to purchase Verified Fan tickets. Each ticket has a one-of-a-kind barcode. Sharing this bar code online can compromise your tickets. Patrons should not share photos of the barcode on your HAMILTON tickets with anyone – especially on social media. Keep them in a safe place. #CoverTheCode is the hashtag for this initiative to protect patrons’ investment.